Small business marketing and great customer service go hand in hand! While I do believe marketing is vital to growing your business, if you have not addressed your customer service model then you are pouring leads into a funnel where nothing is catching them! There is nothing more frustrating than running a fabulous campaign that drives a ton of traffic to your website, blog or store and then finding that sales do not increase. Most of my small business owner clients do not do this deliberately, they just have never though of their customer service process as being vital to their success. Here are a couple of great customer service experiences I have had recently, does your company operate with this level of customer service or have you kind of decided that it is easier to get new customers than to service the old ones? Chase Bank – whoo whoo, who knew that a HUGE bank could provide great customer service? Well come to find out, it really is the humans at the branch that make all the difference in the world! So I was heading out to Vegas last week and had all my change rolled and ready to turn into my bank (not to be named because they are horrible!). Well the bank lady snidely told me they do not take change rolled and that if I wanted to get money for it I would have to go over in the dark corner and unroll it all myself. ARGGGGG. So I took my change across the street to Chase Bank. There Darby and Adam helped me to cash it in even though I did NOT EVEN HAVE AN ACCOUNT. I am sure they wouldn’t do that every week for me BUT I have to tell you, I am a fan for life!!!! Those Chase commercials never got me to consider or talk about a huge banking conglomerate but those nice humans at the branch sure did!!! 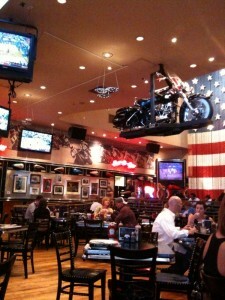 While in Vegas we went to the Harley Davidson diner. Now, Johnny had warned me that service in Vegas could be spotty since he knows bad service makes me wicked mad. The people there (especially Ray our server) were SO NICE. The manager was roaming around helping his servers and everyone was VERY pleasant. That will be sure to stay on my list of places to go in Las Vegas! What this shows is that great customer service is a top down policy. Chase must have some kind of “treat the customer right” sort of policy or the guys at the branch would have been jerks like the TCF lady (oops did I say the horrible banks’ name or that it is on 120th in Broomfield, CO and you should avoid it like the plague!!!). Seeing the manager and how he treated his staff and the customers at the Harley place was also neat to see. You could tell that it was a fun and busy place to work, that the management liked their customers and that every server was happy to be able to help. DANG. So what is your small business customer service policy? I KNOW – many of you only have yourself or one or two employees BUT that does not matter! If you have a service mentality then when you grow everyone under you will have a service mentality. Stuff rolls downhill so make sure that you are positioning your brand and marketing to reflect what your values are and how to treat your customers!